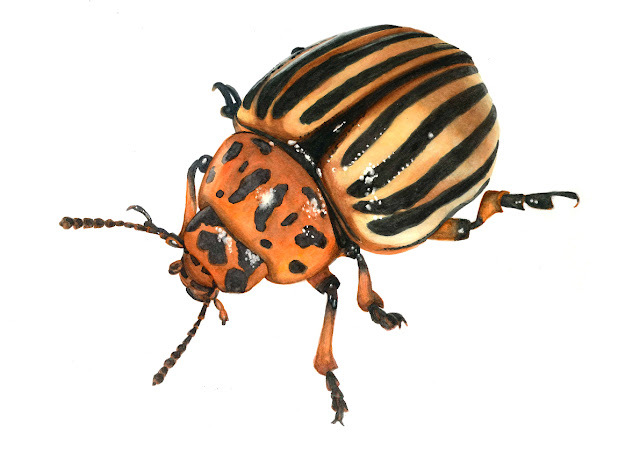 The Colorado potato beetle develops exclusively on Solanaceae, preferably on the potato (Solanum tuberosum L.); also eggplant(Solanum melongena L.) are very susceptible to attacks, the adults of colorado potato beetle migrate on them in the summer when they leave the skeletonized potato plants. Much less frequent are the infestations on tomato (Solanum lycopersicum L.) and sweet pepper (Capsicum annuum L.). Adults are 10-12 mm long, have an oval shape; they have a yellow/orange background color, pronotum and legs with black spots which are irregular in size and shape. The wing covers are lighter in color, longitudinally crossed by ten black band. It can easily be confused with its close cousin and look-alike, the false potato beetle.